An R phylogenetics user just emailed me about a post I wrote (archived here) describing how to resolve multifurcations before calculating contrasts for PIC regression. I just wanted to take a couple of moments to elaborate on this issue. The contrasts algorithm (Felsenstein 1985) requires a fully dichotomous (i.e. 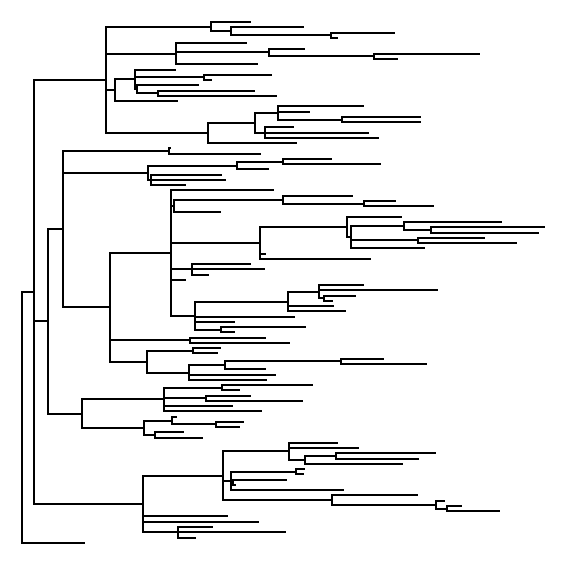 fully bifurcating) phylogenetic tree with branch lengths. By computing the differences between tip & node states, the contrasts algorithm creates a transformed dataset which (under a Brownian model of evolution) is free from phylogenetic dependence. 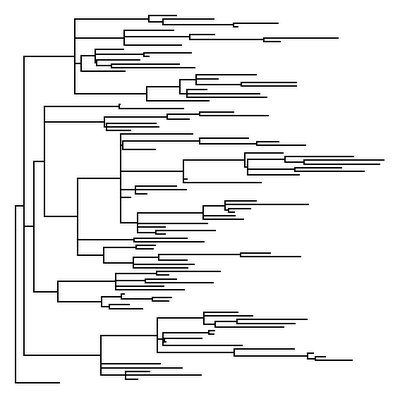 However, if your phylogeny is not fully dichotomous, it can be rendered dichotomous by arbitrarily resolving all polytomies through the addition of one or more internal branches of length 0.0; after which contrasts can be calculated as normal. Since every trifurcation can be resolved in at least three ways (and higher order multifurcations in even more different ways), we may have many options in how we choose to resolve our non-dichotomous tree. For instance, if our tree is fully bifurcating except at two nodes which are each trifurcations, we have 3 × 3 = 9 different ways of rendering our tree dichotomous via the addition of internal zero length branches. and see that it is FALSE. In this case, multi2di(...,random=FALSE) polytomies are not resolved randomly, but in the order they appear in the tree (which appears to be right-to-left in the input Newick string). I have been trying to render my tree dichotomous to calculate the amount of phylogenetic signal usinf pagel's 1999 lamda but the program (r) crashes all the time. Any suggestions as to what is the problem? I have used multi2di to render my tree dichotomous, but when I ask:is.binary.tree the R program return FALSE. Do you have any suggestion for me?